Having admired Aurora pens for many years I was most appreciative to receive the opportunity for a personal tour of their factory in 2006. The company was started in 1919 in Italy - following the Treaty of Versailles - and a country coming out of post-war crisis - it was all a new beginning. Isai Levi, a textile merchant in the town or Turin, commenced the development of an Italian fountain pen. The first pen was named Aurora, now the company name — meaning the dawn. In the 1920, the Parker Duofold was a dominate design in pens. To match this, Aurora issued the Duplex. Made of celluloid, it later became the Internazionale Line. These were large celluloid pens which I have ready are considered by many as some of the most stunning pens produced in Italy. Aurora continued to develop innovative pens. The company survived the difficult times of the 40s and in 1947 produced what is often referred to as the counter to the Parker 51 — the Aurora 88. The company operated from a factory in Torino, but after World War II, moved to a new location on the outskirts of town. That factory has been expanded to meet its production needs. Here is where I saw the hub of activity that includes extensive research and design concepts for various lines of pens (all which start a good two years before production could commence), their labs for testing everything from the durability of clips, the non-skip writing of its inks or the altitude that a pen can handle before ink leaks through the nib - an important point for those who fly! At the time of my visit, Cesare Verono, is the owner and President/CEO of the company. He instilled a passionate enthusiasm for Aurora's products and its goals to increase its production of high-end fountain pens and to expand its business outside of Italy. There is fierce Italian pride in this company. Aurora produced the Hastil pen, the only fountain pen to be exhibited permanently at the Museum of Modern Art (MOMA) in New York. In fact the Aurora was the first pen displayed at the MOMA. In February 2007 Aurora announced it had acquired Firma Srl and the two brands the company distributes: Nettuno and Firma. The acquisition of Firma is based on its historical nature of the brands (Nettuno, Firma), the distinctive position of the collections in the market, and the commitment to innovation and technological research. Aurora also plans to customize Nettuno pens in terms of materials and colours. It takes two and a half years to create a new Aurora pen. This covers the time from concept, design models and final production. 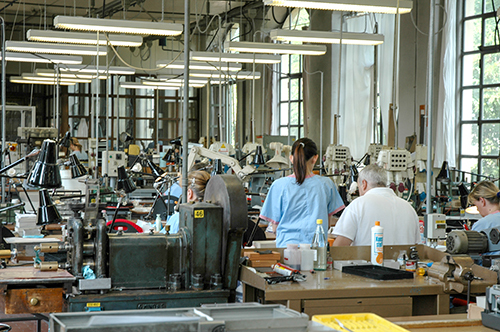 In June 2006 I enjoyed the opportunity to tour the Aurora pen factory located in Torino, Italy. Aurora is one of the leading Italian manufactures of pens. Founded in Torino in 1919, just after the end of the World War I, the name Aurora, the dawn, was chosen to represent the beginning of new things. Since that time the company has lived to that expectation, never forgetting its roots and the passion of the its history and country. From my own involvement in management, I know how companies strive to instill a vision and create a culture that supports its goals. Attaining a company culture is elusive. From my tour of the factory and the opportunity to speak to employees and members of their leadership team, Aurora is well on the way to achieving that target. At the time, I had the opportunity to meet with Cesare Verona, Managing Director. He clearly has his sights on continual sales growth, expanding into markets outside Italy and increasing the blend of limited edition and high end pens as part of their line of writing instruments. In 1993 Cesare joined the family business bringing his experience from working for companies in France, England and the United States. I mention his back ground as his enthusiasm for his company is very evident. Other members of the leadership team such as Arianna Carta, Area Manager, talked about her eagerness to broaden the distribution of their line of pens, leather accessories and paper products. She is committed to increasing market share by building relationships with distributors to make the Aurora products available in more markets. Aurora is meeting its plans as looking back, sales were primarily in Italy with now almost 50% of the sales of Aurora products are in markets outside of Italy. Sofia Castoldi, Marketing Representative, was most gracious in walking with me throughout the factory and explaining the details of the various design, testing and production. I think she succinctly summed up what it means to work at Aurora. Having the joined the company after working in other industries, she explained the difference about Aurora. Here, it is about making objects of art and beauty, based on good design and instilled with the passion of Italy. In 1919, Aurora was originally located in the central area of Torino. 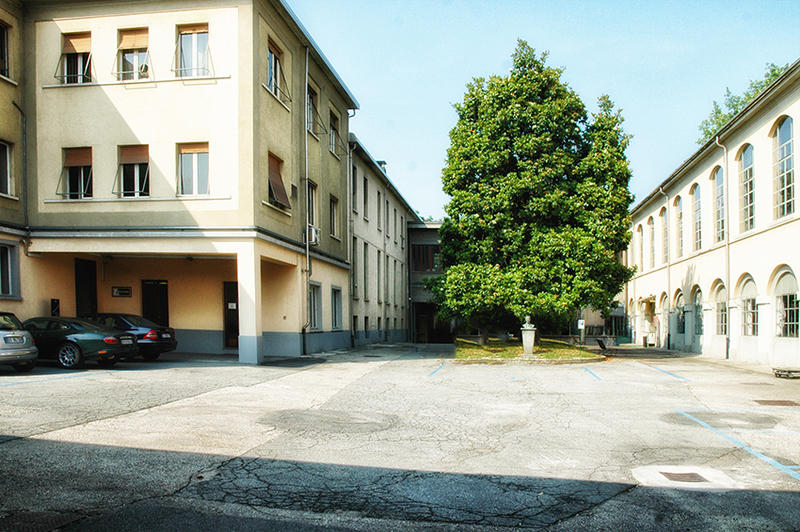 In 1954 Aurora moved to a factory located outside of the central area of Torino and then in 1970 expanded the size of its site to meet the growing production needs. Our tour commenced in the design department. This is where it starts, a good two years before production of a new line of pens results. Designers monitor products of major pen companies, research and inspired by the history of Italy to arrive at concepts for new lines of pens. Aurora uses both in house and external designers. Pens are designed with taste and using technical innovation. For example, the Leonardo da Vinci limited edition pen has a clip that is designed to mirror the mechanics of a bird's wings. Concept sketches and then comprehensive drawings are completed outlining the detailed specifications of each part of a pen. All this takes place well before the work of programming the equipment to run the necessary production steps required to make a pen takes place. Aurora makes all the parts for their pens, and in viewing the various production stages, the number of individual parts that make up each pen is becomes apparent..
Each part is manufactured, shaped and finished using machines and considerable hand work. Aurora manufactures its own nibs, both steel and gold. Their inks are produced by an independent company. 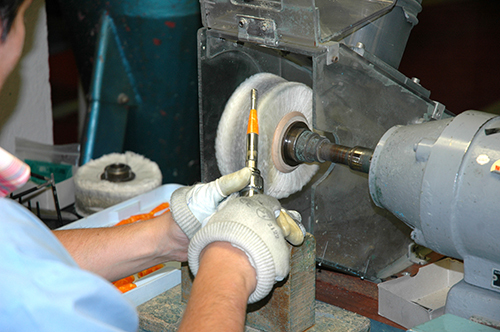 Pen parts are buffed and checked for appropriate fit and finishing. The ink products undergo extensive testing at the factory to ensure they meet Aurora’s high standards. The high standards are evident by the continual quality inspections carried out by employees. With years of service and attained skills the detailed work required on individual pen parts are all completed and checked. In the show room I was able to view the many lines of Aurora pens. Some of which I saw in the various stages of production. There is indeed a pen to match the full range of users. From relatively inexpensive pens used by students, high-end lines such as the Eighty-Eight or the Optima and and increasing line of limited edition pens. The Eighty-Eight, was designed in 1947 and truly represents the classic fountain pen. It is still in production today with more than a million pieces having been produced. The HASTIL pen, holds a special place in the hearts of those at Aurora as its was the first writing instrument to be displayed at the New York Museum of Modern Art. Aurora has a line of writing products as as note books, note pads, boxed stationery and address books. A joint venture between Aurora and the most prestigious paper-mills results in a line of paper products. In addition to pens and paper products, Aurora has an extensive line of leather goods. Some of the items that caught my eye include the pen pouch -- one model holds up to six pens, other models would hold three, two or a single pen. I must admit I had a hard time taking my eye of the large sottomano, the desk pad, that was on the large wooden desk in the office where we held our meeting. At the end of the tour I had the opportunity test out the Optima pen with the various nib styles available. Now. here is a pen for me – a large pen with a flexible large gold nib. Sofia brought out the pens in a large special presentation box. The box hold fifteen pens. Each with one of the 15 nib styles available. I was impressed to see this very box in some of the pens stores I visited later on my travels in Italy. Aurora manufactures pen nibs in sizes from extra fine to broad, oblique right nibs and oblique nibs cut and designed for left-hand writers. I was impressed with the quality of the Optima nib, and I was able to write quite comfortable with all the various nib styles. For a writer that typically uses broad nibs, this says a lot about the smoothness of the full line of nib styles. It was an interesting time seeing the stages of design and production. The employees worked with care and attention and you could feel the pride they hold in the products they produce. As I placed the last of the Optima pens down on the desk pad, ad reflected back on my visit, I can say that I did feel the passion of Italy. Bravo Aurora!